Some of it was filmed at the Bebbington Oval, on the Wirral, you know. The theme music being piped through the changing rooms/showers/toilets suggested it was still it’s main claim to fame (and lets be fair, it’s not a bad one), but I wasn’t there for a spot of sightseeing, I was there for another fast bit of cyclocross racing (I hoped). The dry weather in the run up to the weekend meant the ground was rock solid and some long, wide straights meant the average speed would be high, but there were enough twists and turns to keep your interest high and give those with some technical skills an opportunity to open gaps over the power house riders. Basically it was a great course to race on. Even with my usual rubbish start I had a lot of fun battling my way up into the top ten – there was plenty of room for overtaking on the fast straights and enough twisty sections to try and outcorner everyone around. A couple of crashes in the dusty singletrack meant I did myself no favours in trying to get a good result, but I ended up 5th. Can’t argue with that, really. 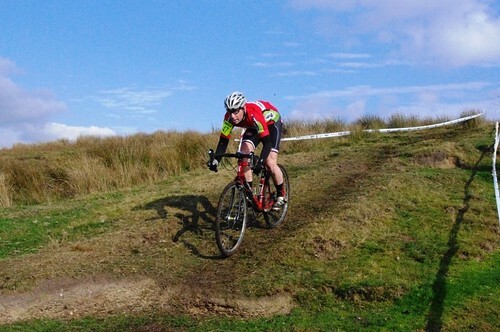 Sunday saw the annual Nick o’ Pendle hill climb. 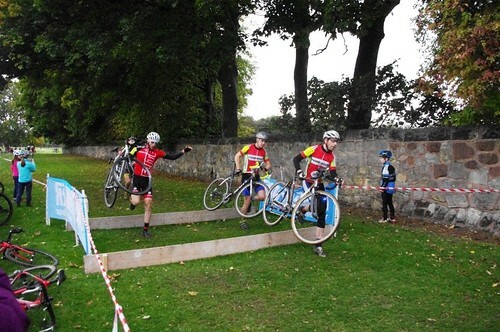 Another event I’d wanted to do for a while, so even though my shoulder and stomach were sore from the ‘cross race tumbles I signed on and gave it a go. By the halfway point I’d decided that the Hill Climb Season being short was A Good Thing. In fact I started to hope someone would step out in front of me and say ” you can stop now, it’s all over”! They didn’t, of course, I just grovelled my way to the top, barely any quicker than when i’m out for a ride with pockets full of gels, a bike laden with bottles and spares and hundreds of miles still to go. Ah well. Something to improve on next time round I guess! “So here we go again”, I think to myself as the lead out vehicle apparently sets off from the front of the tightly massed throng I’ve found myself buried deep within. I’m aware of it only because of the cheer slowly rippling it’s way through us towards the back of the pack. The time to clip in and actually start to edge forward won’t come for a few moments more as 600 riders shuffle and scrape towards getting going. The front few rows are already up over 20mph when we finally start to raise our heartrates and hit the open road. That’s the way it always is. Get what you think is a decent spot on the startline, look away for a second and discover that you’re suddenly near the back without even moving. 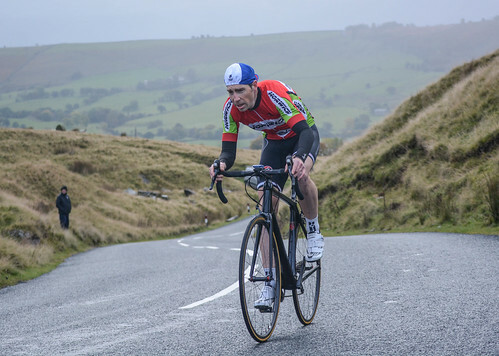 “Still, it gives me something to do while we cruise down this road”, I roll sarcastically round my head as I fight my way from wheel to wheel in the mid to high 20mph’s through the twists and turns of the Dales roads. “This would be a boring bit” I manage to cohere as I fight from the front of one group to the back of the next, across rapidly opening gaps between riders as the race begins to arrange itself. I need to be as far up the pecking order as possible when we hit Simon Fell. With line choices at a premium when the gradient rises, space to breathe, a view of the next obstacle and a chance to spot the next head height footprint are important. It’s worth going deeply into the red for. And I do. It is. And, as a ‘welcome back’ treat, I’m offered one of the best views you’ll ever get in a race, as mile upon mile of northern countryside is teasingly offered from beneath an early autumn inversion that’s almost stunning enough to stop me in my tracks. Any other time I would have just sat down on the edge of the Ingleborough summit plateau and drunk in the sight for as long as it was visible. Not today though. Today the briefest of glances will have to suffice. I have some bog coated fellsides to hurtle down. And through, as my wheels take repeated dives into the semi liquid surface. It may be a gloriously dry and sunny morning, but don’t go expecting too much dust on the dark side of the fells round here. Ever. I clout a couple of rocks that hide beneath the tussocks hard enough to feel the rims bottom out, but reach the cheerful rabbles at Cold Cotes still upright. I’ve lost a few places on the decent (I always do), but after guzzling some drink and squeezing a gel down my neck I’m ready to get them back on the long road drag up to Whernside. Only, it’s not as easy as that. I’m struggling. I’m lucky enough to get onto the back wheel of someone who’s obviously pretty strong and is easily working his way from group to group, but when it’s my turn to sit in front, in the wind and pull us along our speed drops. We’re still flying, picking up riders from slower groups as we pass, but where I should be able to easily pull us along I’m having to duck out and hide in the slipstream to stay with the group. Somehow, as the road begins to climb properly and turns into the track that leads right to the Whernside steps I muster the strength to speed up and pull away from the group, in the hope I can keep the gap on the almost neutralised off-bike clamber to the long summit ridge. On foot I don’t feel so bad. I’m not tired. Not (unexpectedly) sore. Wondering if the road section was just a ‘bad patch’. I actually gain a couple of places on the raggedy stairway towards the next checkpoint and reach the gentler pitches where riding is again possible back to the cheery version of myself that almost tapdanced his way up Simon Fell earlier. I know something’s up the moment I’m not horribly jarred by the first rock I roll over. By the time the rear end of the bike has gripped fantastically in some loose, tyre-scrubbed dirt at the side of the track I’ve already conclluded I’ve got a puncture. The tube’s emptied itself enough to keep the rim bottoming out on harder hits but the leak’s slow enough to leave me in a quandary – do I stop here and replace it, or push on, try to get down the next descent to Ribblehead and fix it there, where there’s support (and, who knows, maybe a track pump)? Two more hefty clouts over the rocks makes my mind up and I pull off to the side of the course away from the riders, marshals, confused looking walkers and utterly uninterested sheep. The tyre goes up in record time (well, up enough to carry on, anyway), jelly babies are stuffed into cheeks, knackered inner tubes are stuffed into jersey pockets and I roll off again just as the leading lady rides past. I ride more of the descent down to Ribblehead than I have in previous years. In the dry the slabs on the upper slopes are fairly simple. Simpler than the rocky section that follows, where blind faith ad a nice lack of overthinking line choices takes the driving seat, as I amaze myself by actually taking back places I’d lost fixing the wheel. I catch up to Andy Porter as the slope levels out near the railway line. His stooped posture and wincing face suggest all is not well – he’s crashed and seems in genuine pain. I feel a bit guilty speeding back up after checking he’s OK to get down to the road unaided, but know that support isn’t far off, for either of us. Despite knowing that a real chance at my best time had slipped away I pause for only a few seconds when I meet up with Angela and Simon by the railway arches that, to any competitor, signal the homeward leg is about to begin. One mountain left. Painfully obvious in the distance but the only thing standing between me and the finish line. I grab a fresh bottle, fling the punctured tube on the floor at their feet and rekindle some fight in my attitude as I start to pick off rider after rider along the undulating road. I need a new aim, a new target, something to fill the empty space now that a ‘best’ has gone. It comes to me as I spot a group of about 10 riders off in the distance ahead of me. Part one becomes catch the group ahead. I do. Easily. And move through it. Easily. Pull it along faster than they were mustering beforehand. Done. 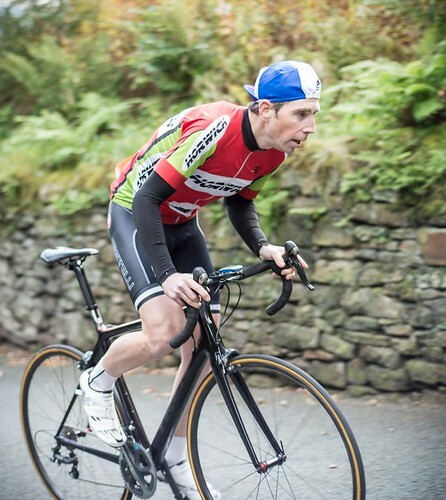 Pop a final gel down my neck before the Horton in Ribblesdale turning. One last swig of drink before the tarmac and ends. Sorry guys, it’s time for me to go. I’ve always done a decent job of the climb up Pen-y-Ghent. It’s one of the few rideable ascents (for a while anyway, as with all of the summits in this race, to get there you’re going to need to shoulder the bike and fight your inappropriate shoes up uncaring rocks at some point) and people are often worn out by the time they get there, while I still have a spark or two of energy left to really race on. I almost like it. Today though, despite not bothering to change the road-ranged cassette on the bike I genuinely attack it. Part two. The group is dropped and rider after rider, first off in the distance, then so close I can see the sweat escaping as I pass, is quickly dispatched as I practice for next time round. I don’t like it this time. It hurts. But the hurt pays dividends as I get to the final high point and turn to begin my descent. I’m back in with a shot of beating my (admittedly modest) personal best. I’ve ridden myself back into contention without realising it. Part 3 is let it go loose on the ride back down. Soften the arms compared to previous years and ride like someone who deserves a sub 3.30 time. Despite a faltering start as poor line choice leaves me dabbing on some off camber grass I soon start to pick up speed and really start to look like I know what I’m doing. Waterbars are skipped over and a few turns are drifted round as the bike starts to respond kindly to it’s new freedom underneath me. Body english. A bit of flow. It works. A few risks work out and I, again, catch a rider or two in front of me. Just as I start to think I’ve got the hang of it as last minute sideways skip to avoid to guys battling it out still on the ascent and not paying attention to what was going on around them slams my rear wheel into another waterbar. The tyre is flat before it reconnects with the ground and, as fast as the descent had felt, I find myself stood trackside even faster, watching place after place skitter past me as I again haul out spare tubes and set about fixing the puncture. Stoicism abounds as I remount and start chasing riders again with a fresh tube fitted. Keep practising. Keep racing for next time. 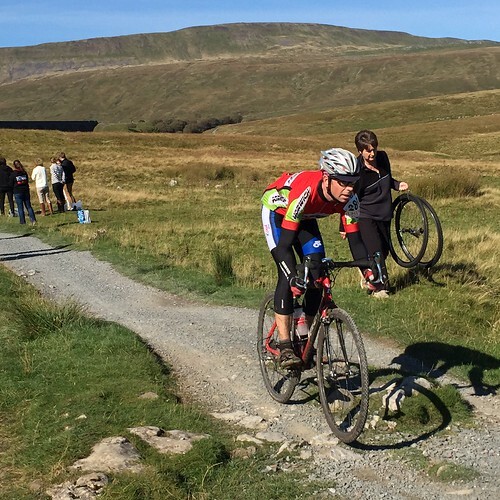 Part 4 is to make the most of the space between the foot of Pen-y-Ghent and the finish line. For many a smooth surfaced chance to revel in getting round, for some a final fight against those who wouldn’t get dropped. I want to be ready for it if it happens. An Evans Cycles rider hops on my wheel as I pass him on the false flat. Perfect. I look for opportunities to attack. No slowing down or easing off. Any incline is sprinted at until there’s nothing behind me and only the finish line in front. I cross the line eager to line up for the start again.